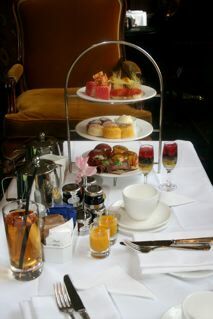 I recently had another birthday (not telling which one) and as a gift, my husband took me out for “tea” to the Sheraton Grand. 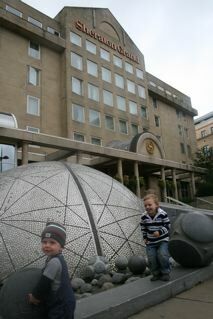 We arrived with time to spare so the boys played amongst the giant stone balls out the front. There is still an awesome buzz in the city even though The Festival is winding down for another year. We plonked down at the first table we came to, unloaded our shopping and tried to settle in. By this stage the kids were getting a little agitated, being tired and hungry, so “settling in” was challenging. The first two waiters were friendly….. but also busy….. and were very little help. The fact that we were still too early for tea meant they couldn’t do much for us anyway. The third waiter then informed us we needed to move, as children weren’t allowed near the bar…. silently pulling my hair out we re-loaded our shopping and found a new table. Armed with menu’s, a lovely white table setting, a high chair (sigh) and a smile, this woman turned my experience around. First came the Tea, drinks for the children and a few biscuits to tide them (us) over. Baby R is well entertained by the ice in his glass and isn’t too interested in the food (yet) but Master D is closing in fast. Not interested in the savories at all, he heads straight for the scones so he can use the little jams! 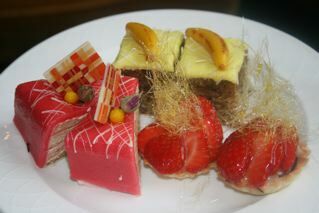 From the four types of afternoon tea available, we chose the ‘Seasonal Shades of Summer’, which was exquisite. To take the kids or not to take the kids? Honestly…..? They would have had more fun having a picnic in the park or even (especially?) going to maccas. I definitely enjoyed myself, however I would have relaxed more if I’d taken my friend up on her offer to baby sit for the day! Or find out more about me! What On Earth Is Cranachan?